There are two sorts of castles or châteaux in France. There’s the sort that was used in wars and battles; and there’s the sort we visited today. Today’s is the sort that explains why the revolutionary ‘have-nots’ in France so deeply resented the ‘haves’ who had all that they could have. Chateau de Villandry was built in the 1500s by razing the remains of one of the earlier war-castles and creating an enormous, luxurious house with carefully managed gardens of exquisite beauty. It passed eventually into the hands of Napoleon who gave it to his younger brother as a present. From there it gradually declined until, in the early 1900s, it was bought by an interesting couple – he Spanish, she rich American – who brought it back to its former glory. The château itself is mildly interesting; it suffers significantly, from a tourist point of view, from having been used as a real living house until recently. There are a number of rooms set up to show how people used to live, although the times they purport to represent seem to vary widely. 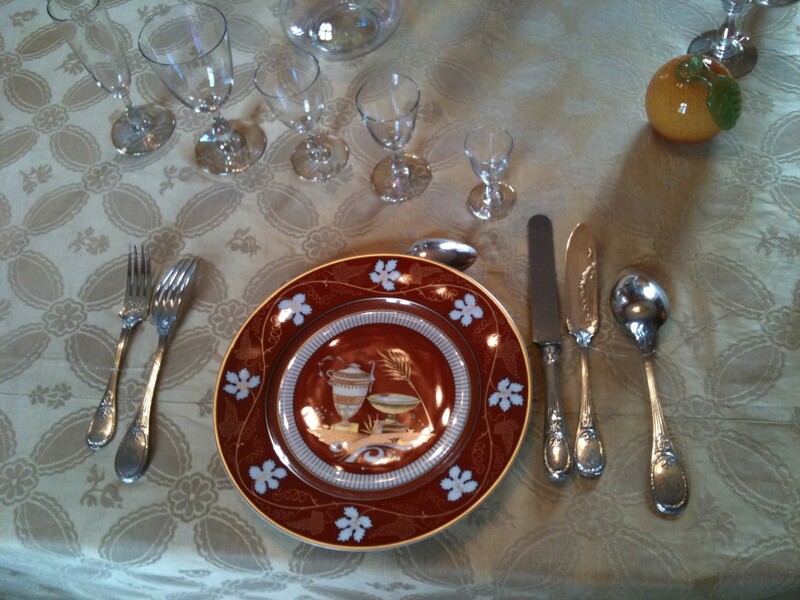 There was a nice formal dining room set up where Grandma asked the boys what the unusually broad knife (the fish knife) was for. Declan thought deeply for a moment and then ventured “A knife for eating crepes?”. There’s our boy. 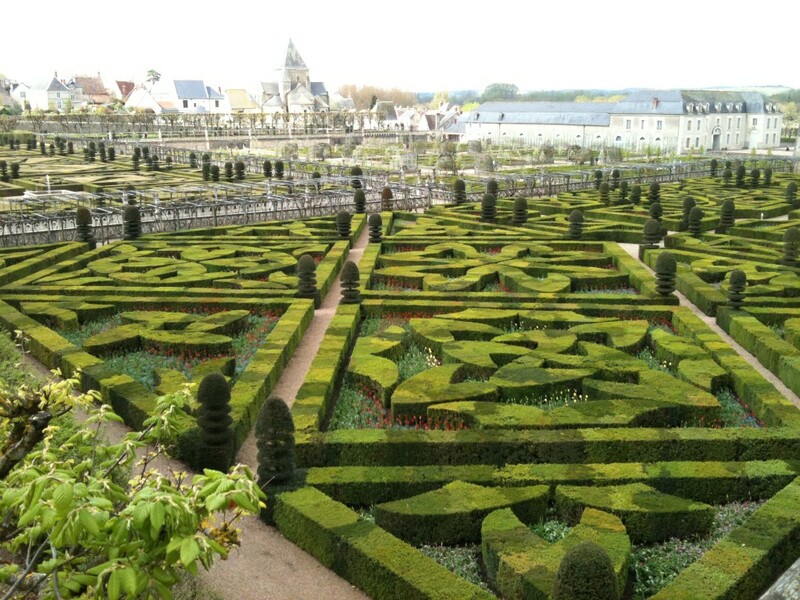 The gardens are the thing that makes Villandry really special. In the middle ages rich people used to set out their vegetable gardens in a very formal fashion. 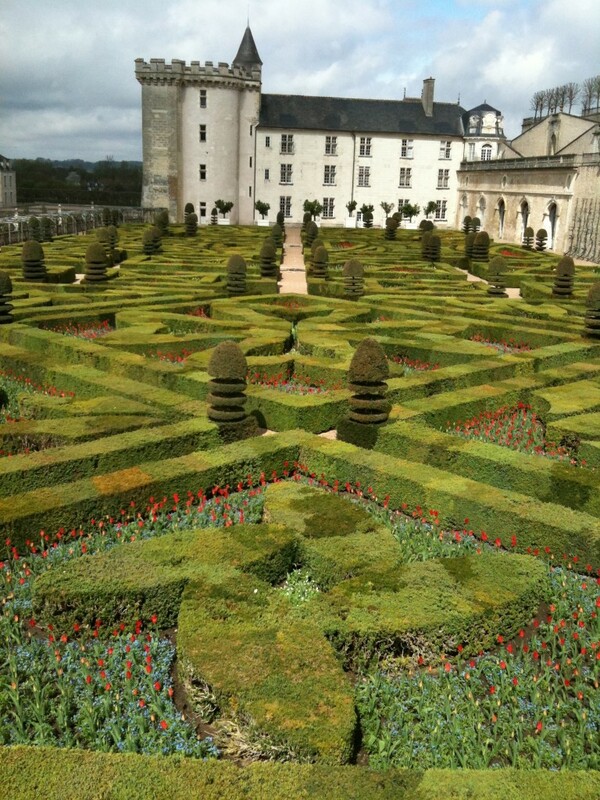 Villandry is the only château where you can still see this. It’s not just a simple matter of using geometric layouts, because of the need to rotate crops it’s an incredibly complex pavane of constant movement. The result is quite lovely in a very mannered way. Back home in the evening we decided on a barbecue for dinner. Luckily our landlords had laid in a supply of local vine off-cuts to cook on. The result was a very tasty combination of chicken and sausages eaten outside in the courtyard. This was our first meal outdoors in a long time and it was lovely to finish with homemade chocolate mousse (there you are Jan McAdam) and a glass of local wine while the kids ran round the garden. The sort of end to a day which makes me thing that we’re the “haves” now.